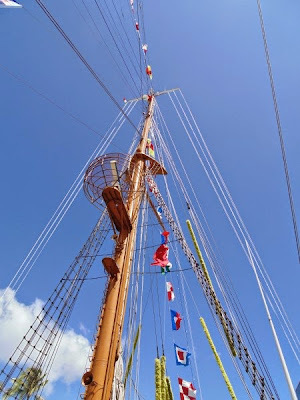 We end our Mexican Navy Tall Ship Cuauhtemoc series by looking up. 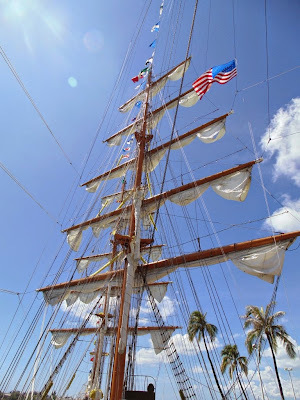 I think it is fitting to end a tall ship series by showing off just how tall these ships are. The first shot is an upward look at the sails from board the ship. The bonus photo is a look up at the “crows nest”. I don’t think you could pay me enough money to climb up there especially while the ship is in motion. That is just wait the sailors do. Unfortunately I was at work when the ship left port with all the sailors standing atop the masts. Maybe next time. To get an idea here is the shot I took of the Colombian tall ship ARC Gloria leaving port. This entry was posted on Tuesday, November 18th, 2014 at 12:19 am	and is filed under Feature, CityPhoto, cultural, Hawaii Photo of the Day, Attractions. You can follow any responses to this entry through the RSS 2.0 feed. You can leave a response, or trackback from your own site.